There's only seven days left, so get your MIA nominations in now! 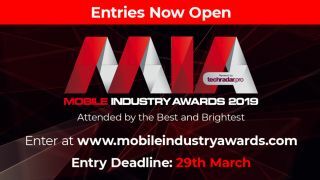 Entries for the Mobile Industry Awards 2019, powered by TechRadar Pro, are open now - and you have one more week to enter. Entries on the 20 categories for this year's awards are set to close next Friday, March 29th, at 5pm, meaning there's not much time left to get your submissions in. The final selection for the 2019 Mobile Power 50 will also be revealed on Monday, March 25th. The Power 50 is the definitive list of the most influential figures in the UK mobile industry during the past year. The list is compiled after in-depth interviews with key senior figures across the industry, from operators and retailers, to manufacturers and distributors - but your votes will help decide the final say.